The Dolphin Swim Adventure is your chance to live out a classic Hawaii vacation fantasy and swim with dolphins. Participants learn about daily dolphin life and interact with them up close and personal in this intimate and educational dolphin adventure on Oahu. Guests enjoy a kiss, belly ride and a single dorsal tow with a dolphin! After a short orientation, you get to spend 30 minutes with a dolphin. 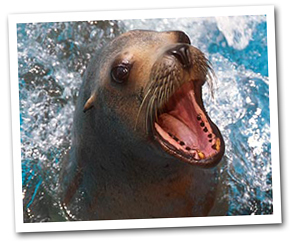 Participants in the Dolphin Swim Adventure can pet the dolphin, pose for a big dolphin kiss, perform various close contact interactions, and view a Sea Life Park Hawaii dolphin underwater - all while a trainer educates you about these amazing animals. 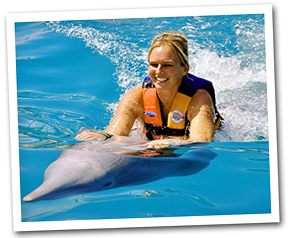 Book Online Today and swim with dolphins during your next visit to Oahu.